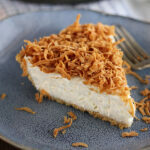 Creamy coconut and cream cheese filling is topped with crunchy toasted coconut in this Creamy Coconut Pie! In a large bowl, use a mixer to cream the cream cheese and powdered sugar together until smooth. Mix in the almond extract. Using a spatula, fold in in the thawed whipped topping. Stir in 1 1/2 cups of the coconut. Spread the filling evenly into the prepared crust; refrigerate. Toast the remaining 1 cup of coconut by spreading the coconut out on a baking sheet lined with parchment or a silicone baking mat. Bake for 5 minutes then stir the coconut. Continue baking in 5 minute intervals, stirring after each one, until you reach your desired color. Once it starts to toast, it toasts very quickly. Allow it to cool completely and then store the toasted coconut in an airtight container until ready to use. Top the pie with the toasted coconut when ready to serve.